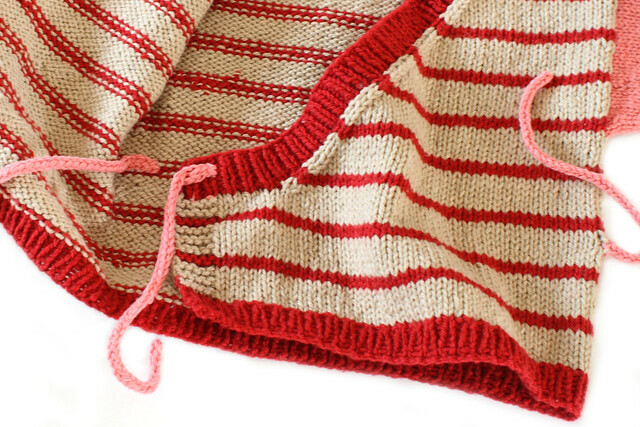 It’s not often that knit my own patterns after they’ve been published. After all the test and sample knitting it’s nice to move onto other projects. 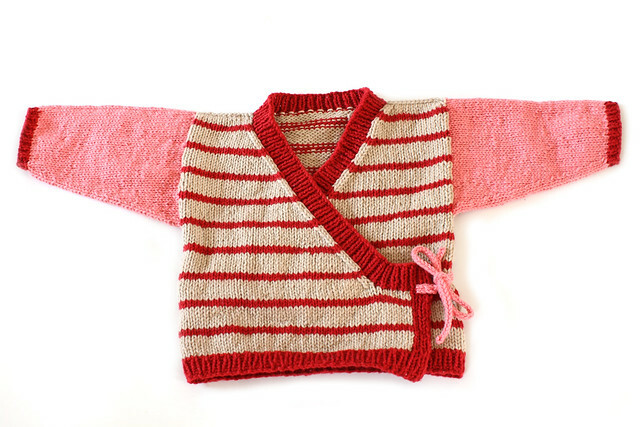 Enough time has passed since I designed my Baby Wrap-Cardigan for me not to mind making another one, so I whipped one up for a friend’s baby girl using the same cotton yarn, recycled from a cardigan, as the original. It is mighty cute and I really appreciate the lack of seaming. I didn’t even begrudge knitting in cotton because the colours work so well together and it’s nice to have put it to good use. I made a few changes to the original design; I added a bit of length, I made the sleeves a bit wider and I swapped the buttons and press-studs for ties. Parents have told me that they find ties much easier and that most baby clothes come up a bit short. The ties are two-stitch i-cords, about 6 inches long. They are knitted onto the garment stitches, rather than sewn on, for a bit of reinforcement. They’re easier than buttonholes, especially on a length-adjusted garment because there is no need to consider their placement until the end.